﻿The Peer Leadership program has been a Haddonfield Middle School tradition for over 20 years, and consists of 7th and 8th grade students who pledge to be drug-free and serve as positive role models within our school community. HMS Peer Leaders are generously funded by the Haddonfield Municipal Alliance & The Rotary Club of Haddonfield. 7th and 8th grade Peer Leaders submit an application to be considered for admission to the program. Once accepted, students attend an intense day of training, as well as weekly meetings before school. 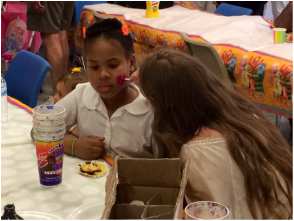 Students volunteer to ﻿complete ongoing service projects throughout the year. The students and faculty advisors are committed to leading by example and improving the quality of Haddonfield's school and neighborhood community through service learning. Each year at the beginning of May, all 6th grade students receive information about the HMS Peer Leadership Program. Applications for the program are available in the main office and on our website (on the Forms and Handouts page) around this time of year. Interested students should pick up an application or print one out and return it to the designated Peer Leader Advisor by the appointed deadline, which usually falls in mid-May, and is communicated to parents through a letter from Ms. Matozzo via the HMS News. All of our HMS students benefit from service opportunities, and every child has the chance to engage in discussions that can prove pivotal to their academic, social, and emotional growth. However, to qualify as a Peer Leader, it is the expectation that students have already demonstrated the ability to lead these discussions and to motivate others to join in service projects. 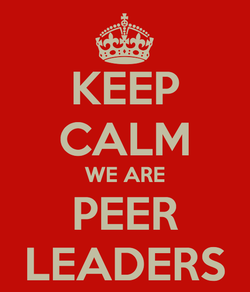 Those ultimately selected as Peer Leaders must lead school-wide discussions; teach and facilitate classroom presentations; and organize major service projects. 1. Return a completed application to the designated 7th or 8th grade Peer Leader Advisor by the appointed deadline. 2. Participate in an interview process with all of the Peer Leader Advisors. 3. Attend a day-long training which takes place in early September (on a school day). This is mandatory, and an inability to attend will affect membership. 4. Attend and participate in 7:15 AM meetings every Wednesday morning (8th grade program) or Thursday morning (7th grade program) during the school year. 5.Participate in service projects and community based events throughout the year. 6. Meet the requirements set forth in the Code of Conduct as determined by the advisors and school administrators.